I dropped by my local Goodwill this afternoon and found what I consider the score of scores, inch and a half and one inch curved basting pins in an assorted pack, nickel plated for $1.25 per pack of 100. If any of you have priced basting pins lately, you will know that this is a really good deal. I bought sixteen packages and may go back tomorrow and get some more. I test drove the pins to check the quality and they work just fine. 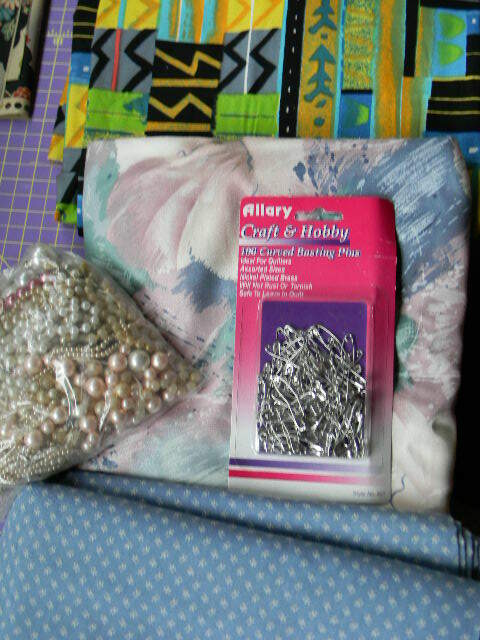 And I did find the three fabric pieces, all 3 yards pieces for $3.99 each, the bag of costume jewelry pearls for $1.99 and a large wood desk for $25.00 that will make an awesome FMQ table. Great find. I like the geometric designs on the black, yellow, & blue fabric. I love any fabric that has an ethnic flair. I am contemplating making a kaleidoscope quilt with it. I already checked the repeats and it will work. YIPEE for your score! I've been really good this year and have been staying out of resale shops....well at least I've gone in and not purchased anything....that counts as staying out...in my books. I had some of that fabric you have the pins laid on. I just loved it. You scored really big. That is a great find! Have you noticed the quality of basting pins has gone way down. They are getting so flimsy that you can hardly get the pin through the sandwich without bending it. What a haul! I am so thrilled for you! Great score! I love it when this happens! Never can find anything great at my goodwill. You did good. I have that fabric under the pins. I used to be able to find fabric at Good Will, but I guess to many people are on to the good finds as it's getting harder to find. Oh, to have a Goodwill that had anything even remotely comparable....would be heavenly. I'm excited about the desk!!! Great find/score! I love Goodwill!!! Have a great day and happy sewing ! Good for you, always nice to get a great deal.